Our professionals offer garden waste removal and disposal in Felham and the region. They clean yards and gardens overgrown with many shrubs and trees. We also offer dismantling of sheds, metal and wooden structures, construction and household waste removal etc. We are equipped with the right tools and vehicles for any required job. Don’t hesitate to call us when you need garden waste clearance services in Feltham TW13 ! 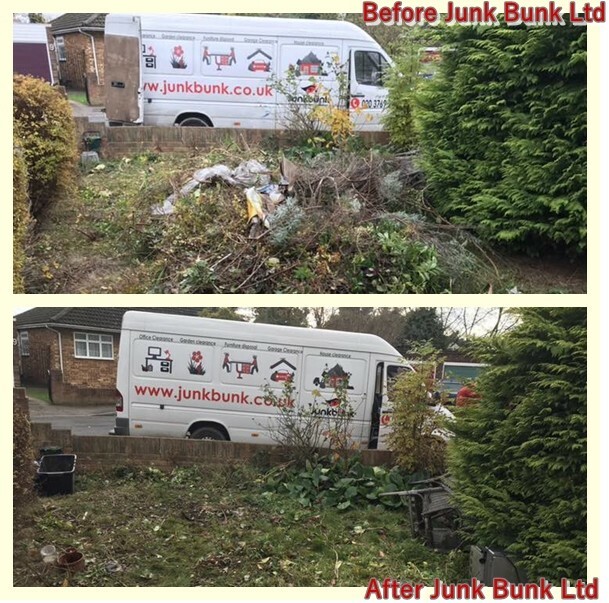 We can provide garden clearance at any time when people need it. Such junk may result from a storm, torrential rain, or building repairs. Spring and autumn garden and yard clearance also requires our professional help. How much does it cost to clean your garden from piles and waste? Garden waste removal service is not expensive. We try to provide the best quality at budget-friendly prices. Contact us now and we will give you a detailed information. Often the hard work is not the one in the office, but the maintenance of the relaxation area in your home, because the weekends spend in cleaning the yard from branches and waste can be a real nightmare. There is now someone who can do this at low prices for you. Call Junk Bunk now!